Rating: 5/5 – You MUST try this out! Once upon a time people stored all their deepest, darkest secrets in something called “the cloud”. One day the cloud burst. Every message you though was safe, every photo you thought you deleted, every mortifying little search you made…it was all there for anyone to use against you. It’s 60 years from now & life is VERY differnt in a future Los Angelese viewed through a funhouse mirror reflecting aspects of today’s web/media obsessed world gone horribly wrong. People hide their identities & most everything else about themselves as a normal part of everyday life. It’s common to wear outlandish masks while going about day-to-day business. The press & the police have merged. Welcome to the world of unlicensed invetigator, P.I., who gets entangled in a murder investigation. 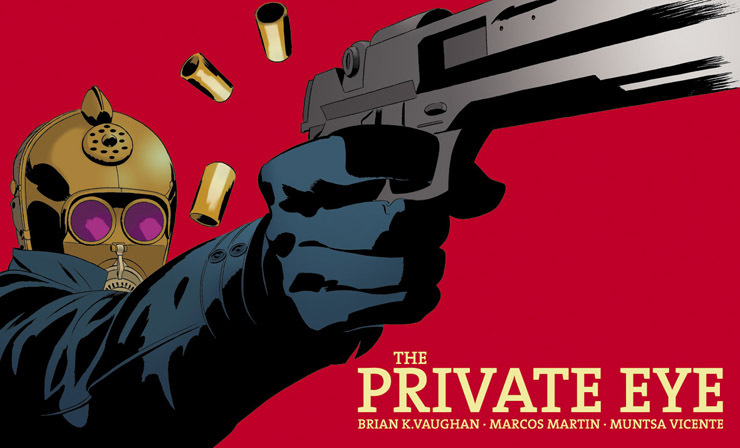 This direct-to-digital series by Brian K Vaughn (writer of Saga, a title in my personal Top Ten, as well as many other excellent comics series) & Marcos Martin (who did some signature work on Marvel’s Daredevil, among other things) is something not to be missed. They are pioneering a “pay what you want” format where you can give them whatever you think is fair and it goes directly to them, not to a publishing house and without any intermediary digital distributors in between you & them. You can pay the $3.99 you’d give for a new Marvel comic or a penny (but this is truly worth more than that….) Without knowing the specifics of the math, I’m guessing that even if you pay them $1 more money will end up in their actual pockets than if you bought a comic for $3.99 that they did through a publisher that subsequently also passed through the hands of a digital intermediary or two. We’re two issues into the story and this is one of the best series I’ve read all month. The price cannot be a barrier to entry, you owe it to yourself to give this a try, grab #1 and give it a read. I’m guessing you’ll be back right away for #2! This entry was posted in PanelSyndicate and tagged Brian K. Vaughn, Marcos Martin, P.I., PanelSyndicate, Private Eye. Bookmark the permalink.